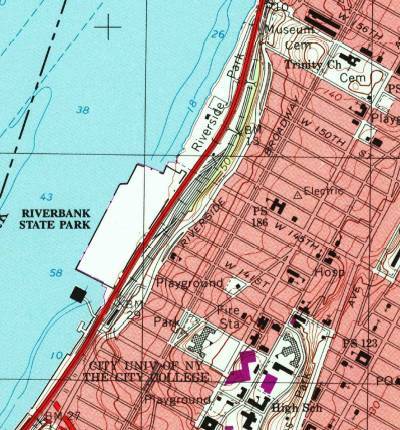 Map showing the Riverbank State Park, extending into the Hudson River along the West Side Highway and the Amtrak lines. 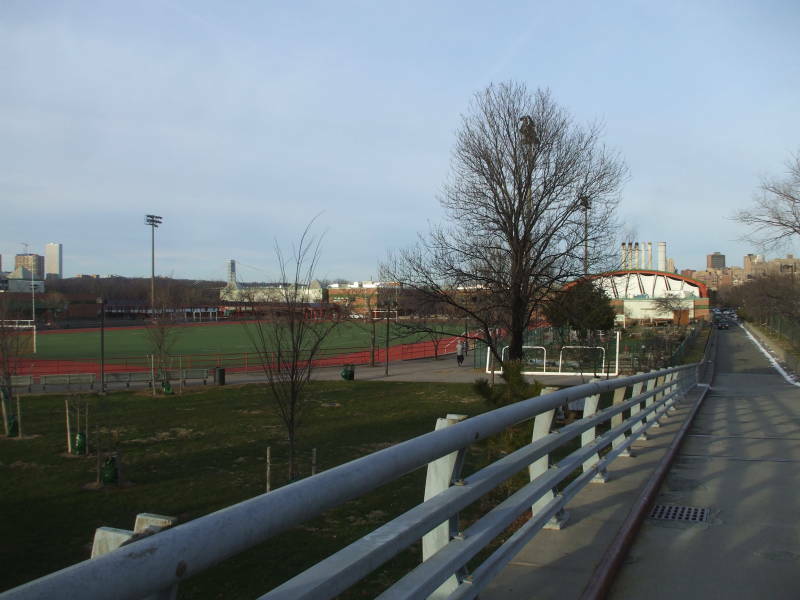 Riverbank State Park is on the west side of upper Manhattan, between 137th Street and 145th Street. It lies to the west of the Amtrak lines and the West Side Highway, extending out into the Hudson River. The park has three swimming pools, including one of Olympic dimensions. There is a covered skating rink, for roller skating in the summer and ice skating in the winter. There are several sports fields and basketball courts. It also has an 800-seat theater, an athletic center, and a restaurant with views up the Hudson River valley past the George Washington Bridge. The surprising thing is that the 11-hectare (or 28-acre) park is really a "green roof" on the top of a wastewater treatment plant. Some of the surface is synthetic playing field material, but much is grass and other plantings. Trees up to 35 feet tall grow here. Riverbank State Park, on the roof of the North River Wastewater Treatment Plant. 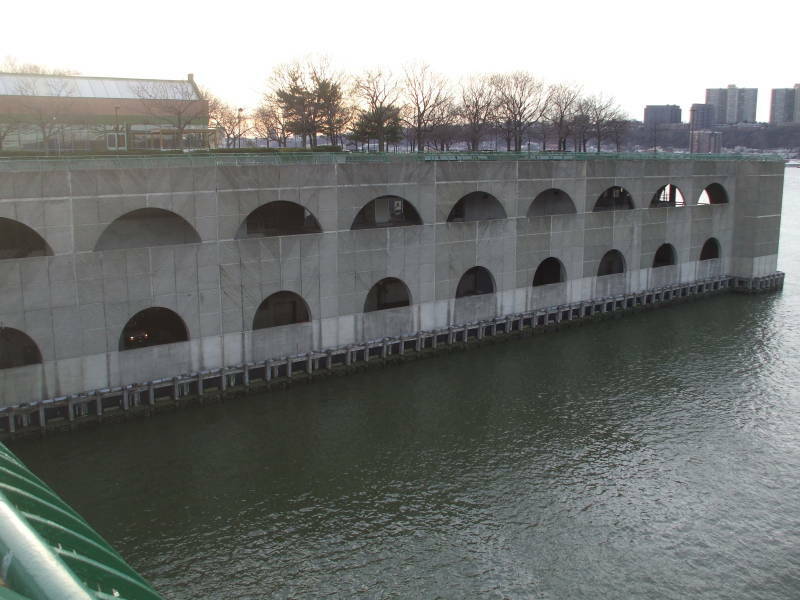 The River North Wastewater Treatment Plant is the newest of New York City's 14 wastewater treatment plants. It serves a population of about 590,000 people in the west half of Manhattan north of Bank Street, which is in northern Greenwich Village. The plant is designed to handle about 640,000 cubic meters each day. The Croton Aqueduct had opened in 1842. 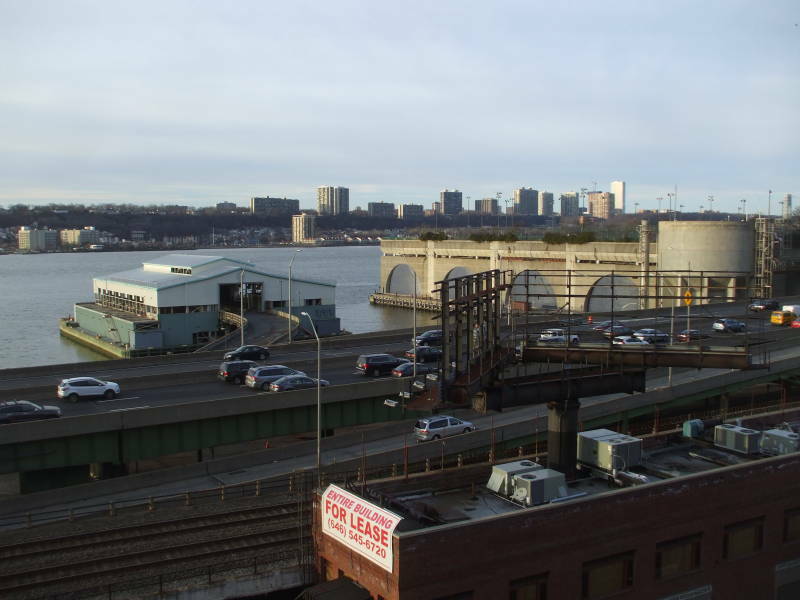 It crosses the High Bridge from the Bronx to Manhattan at 174th Street, a little north of the North River plant and on the eastern shore. 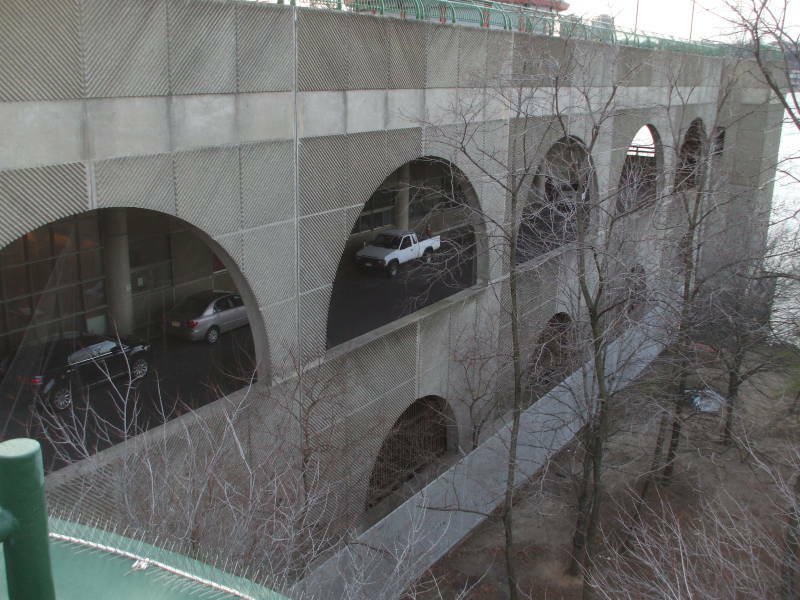 The Croton Aqueduct brought clean drinking water into the city. The citizens could now use more water, and in the process they took drew less out of wells and cisterns. This made the water table rise. Cellars began to flood, especially in the tenement areas. The city started building sewers, starting in those flood-prone tenement districts. There were 238 kilometers of sewers by 1852, just ten years after the Croton Aqueduct opened. Now the city's Department of Environmental Protection operates a grid of 11,900 kilometers of sewer pipes. The sewer system collects and treats a combination of sewage waste and runoff from rain and snow. The system collects 4.9 million cubic meters of liquid every day. 96 pump stations move the wastewater to 14 treatment plants. The city first looked into building a treatment plant in upper Manhattan in 1914. The City Planning Commission only decided on this site in 1962. They commissioned design studies, and a final plan was approved in 1971. Construction started in 1978. First, 2,300 caissons were driven up to 70 meters into bedrock. Those caissons support an 11-hectare reinforced concrete platform. The platform was completed in 1978. Construction of the advanced preliminary treatment systems started in 1983. Then the secondary treatment components were started in 1985. The advanced preliminary treatment system went into operation in March 1986. For the first time in its history of European settlement, the city no longer discharged raw sewage into the Hudson River. The secondary treatment system began operation in 1991. The park opened in 1993. 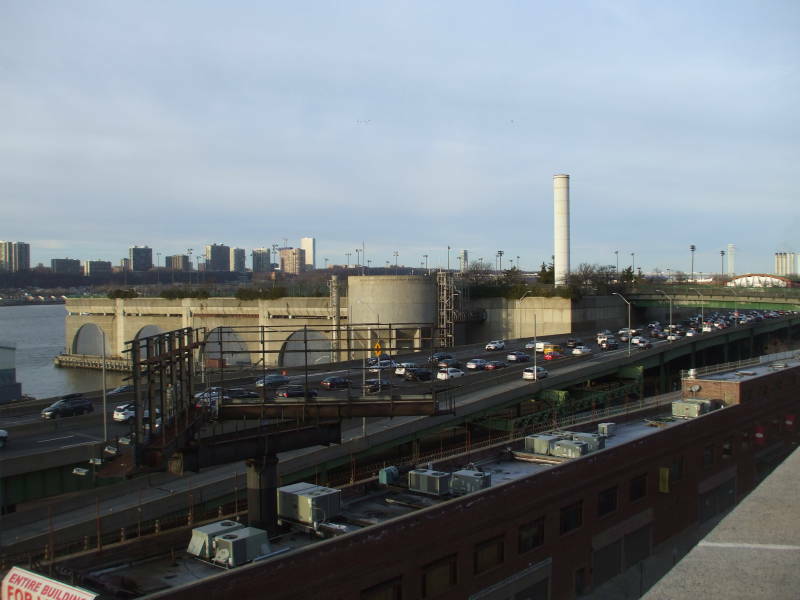 Looking over the Amtrak tracks and the West Side Highway to the North River Wastewater Treatment Plant. An 11-mile main interceptor sewage line runs north to south along the west side of Manhattan, from near Bank Street in Greenwich Village to the northern tip of the island. This brings wastewater to the plant well below ground level. The inflow is about 475,000 cubic meters per day during dry weather. The inflow first passes through a series of bars that remove large items — trash, tree limbs, mob hits, etc. The bulky debris gets transported to a landfill. Five large pumps lift the liquid up to the primary settling tanks up on the platform above river level. The water moves slowly through the settling or sedimentation tanks. Oil and grease rise to the surface and are skimmed off. Heavy solids settle to the bottom as primary sludge. The sludge is scraped off for further processing. The wastewater is then moved into five 30-foot-deep tanks for secondary treatment. Air is blown into the bottoms of the tanks, stimulating the growth of aerobic bacteria and other microorganisms which digest or break down organic material. The wastewater is then routed into sixteen final settling tanks. Heavy solids again settle to the bottom as sludge. The wastewater left at this point is disinfected with sodium hypochlorate (or NaClO) and released into the Hudson River. The sludge is sent to thickening tanks for at least 24 hours to further settle out of suspension. The water from the thickening tanks goes back to the aeration tanks of secondary treatment. The sludge is still about 96% water. It is sent into tanks called digesters which are heated to 35 °C. Their oxygen-free atmosphere encourages the growth of anaerobic microorganisms to further break down organic material. This stage produces biogas, which is primarily methane or CH4. This provides fuel to drive some plant operations. The next step is dewatering. As its name indicates, this stage removes water. The result is biosolids, a moist soil-like material. The North River plant doesn't have a dewatering component. The sludge left after anaerobic digestion is carryed by barge around Manhattan to the Wards Island plant for dewatering. All of the biosolids coming out of the eight plants with dewatering facilities are hauled away by companies that either apply them directly to soil or use them to produce fertilizer. North end of the North River Wastewater Treatment Plant. Air from the plant area is sent through a large tank containing sodium hypochlorite (NaClO, a component of household bleach) and sodium hydroxide or lye (NaOH). Then it passes through activated carbon filters to absorb odor-causing chemicals. It is exhausted through 30-meter-tall ventilation stacks. The stacks provide the main clue for visitors that the park is a little unusual. 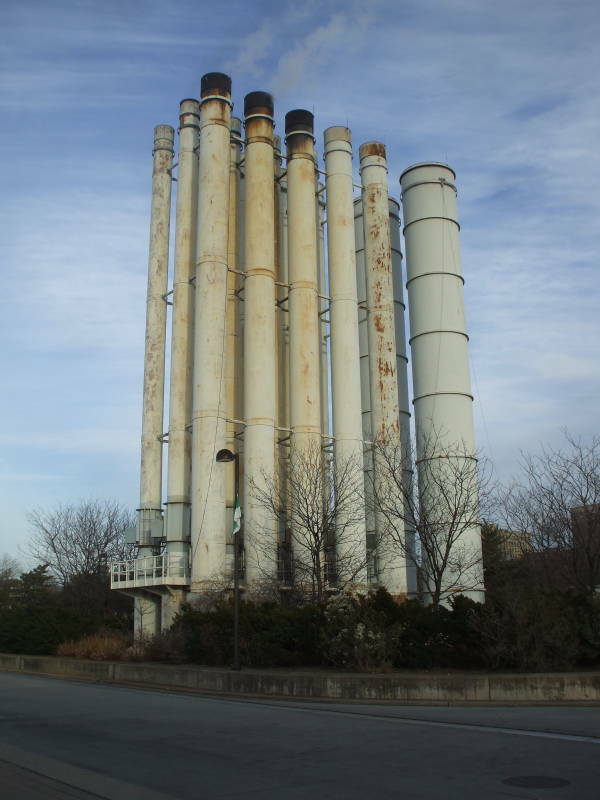 100-foot ventilation stacks on the North River Wastewater Treatment Plant.